FILE - Avatarmind's iPal Smart AI Robots, designed to be companions for children and elderly, perform calisthenics during the 2018 CES in Las Vegas, Nevada, Jan. 9, 2018. The Jan. 8-11 Las Vegas trade event offers a glimpse into new products and services designed to make people's lives easier, fun and more productive, reaching across diverse sectors such as entertainment, health, transportation, agriculture and sports. "Smart" devices using various forms of artificial intelligence will again be a major focus at CES. Visitors are likely to see more dazzling TV screens, intuitive robots, a range of voice-activated devices, and folding or roll-up smartphone displays. Also on display will be refinements to autonomous transportation and gadgets taking advantage of 5G, or fifth-generation wireless networks. 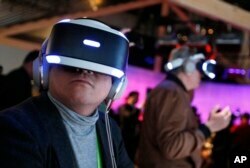 FILE - People look through Sony PlayStation VR headsets after a Sony news conference at CES International in Las Vegas, Jan. 8, 2018. "I think 2019 will be a year of trust-related challenges for the tech industry," said Bob O'Donnell of Technalysis Research. There will be a focus on artificial intelligence that can "personalize" a user's experience with a device or a car, or even predict what someone is seeking — whether it's music or medical care. But because this ecosystem is built around data, confidence has been eroded by scandals involving Facebook, Google and other guardians of private information. "The public is wary because of recent events," said Roger Kay, analyst and consultant with Endpoint Technologies Associates. "I think the industry will be slowed by this skepticism." Carolina Milanesi, an analyst with Creative Strategies, said, "You'll definitely hear people talk about security more, and really looking at how you secure the data," at CES. The Consumer Technology Association, which operates the show, acknowledges that the sector is being hurt by tariffs and trade frictions between the two largest economic players, the United States and China. Tariffs on tech products jumped to $1.3 billion in October, according to CTA, raising fears about growth. "It's almost inevitable that an economic slowdown will occur if these tariffs continue," said Sage Chandler, CTA vice president for international trade. The U.S.-China trade issues and the arrest of a top executive of Chinese giant Huawei in Canada have thrown into question the "supply chain," the system in which U.S. designs are manufactured in China for the global market. "This does cast a shadow over CES," O'Donnell said. 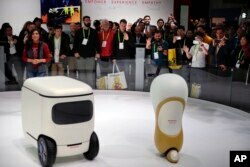 FILE - Attendees wave at Honda robotics concepts 3E-C18, left, and 3E-A18, at CES International, in Las Vegas, Nevada, Jan. 9, 2018. Japanese carmaker Honda will be showing an "autonomous work vehicle" which can be configured for search and rescue operations, firefighting and other uses. The show includes startups offering "predictive" health care solutions designed to anticipate the kind of care senior citizens may need. And consumer products group Procter & Gamble, making its first appearance at CES, will demonstrate ways to use facial recognition and AI for improved skin care and beauty recommendations. The new applications raise questions on whether consumers are ready for technologies that evoke the notion of Big Brother and a surveillance state. Brenda Leong, senior counsel at the Future of Privacy Forum, a Washington think-tank, said consumers should be mindful about whether data from facial recognition is kept only on the devices, such as in the iPhone, or held in a database. "Even if commercial institutions are collecting the data, everybody is worried about government access," she said. Patrick Moorhead of Moor Insights & Strategy said consumers have shown a willingness to adopt these new technologies if they offer convenience. "If they are balanced from a benefit point of view, those worries are going to go away," he said. Moorhead noted that as facial recognition has become a standard feature for many smartphones, "those fears have faded." O'Donnell said consumers are starting to understand more about data and become more discerning about which companies and devices they trust. "Personalization is something people want, and they are willing to give up some privacy to get it," he said. "But if they can get personalization on the device without sending it to the cloud, they get the benefits without giving up privacy."